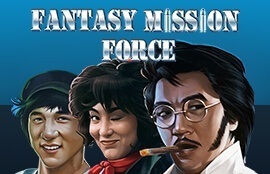 If you’re a fan of Jackie Chan, you may be familiar with a bizarre 1983 film, in which he starred titled, Fantasy Mission Force. Now, over three decades later, Real Time Gaming released a slot that takes its inspiration from the cult classic, reimagining the story in cartoon form, with a gem that offers you potentially unlimited free spins! The plot follows a team of misfits who have been tasked with saving several generals who are being held captive by the Japanese, during a war. Therefore, the reels of this 20 payline slot, are set amidst a battlefield and the brilliant graphics will transport you right into the middle of all the action, aided by snippets of footage from the original feature film. Symbols such as guns, bullets, jet planes and knives, can be found alongside icons depicting some of the characters from the film. The Scatter and the Wild, depicted by bundled dynamite and a bag of money respectively, will bring you the highest payouts, as they come equipped with their own multipliers, and can trigger various free spin options. The Wild substitutes for all the symbols except for the Scatter. The dynamite Scatter, which only appears on reel 1 and the wild bag of money, which only appears on reel 5 are required to appear together, in one go, in order to activate free spins. Such a combination will award you with 7 free spins. All your winnings will be tripled during this round and you will receive additional Multipliers whenever the Wild or the Scatter appear on the reels. Landing two dynamite symbols and two character icons portraying the man smoking a cigar symbol will also earn you more free spins. Last, but definitely not least, the Bickford fuse may appear on top of any symbol. Three or more fuses on screen will explode, earning you 3 free spins, per fuse, activating the Kaboom! Feature, which can be re-triggered indefinitely, potentially turning your original 7 spins into unlimited free games! Fantasy Mission Force offers wins of up to 50,000x your bet and with this slot available on Instant Play, Download and Mobile, you have the chance to score epic wins from anywhere you please. Try your luck and this online slot at Jackpot Capital online casino today!